I saw Star Wars The Force Awakens just over a week after its release and, since then, I've been reading what people have had to say about it before writing my own commentary. This won't really be a review so, if you haven't seen it and you're a Star Wars fan, stop reading now. Go see the movie. It's awesome, you'll love it and you won't care about any of the similarities with the original trilogy. In fact those things are part of why it's so good. Don't believe those dicks that say the movie brings nothing new to the table, it does, they're dicks, go and enjoy the film. Star Wars, The Force Awakens is very much a fan service movie. You'll get no argument from me on that point. However I'm listing that as one of its strongest and best features. Fans of the original trilogy were largely unimpressed by the prequel trilogy for what wasn't in them more than what was. Almost everything that was good about the originals wasn't in the prequels. 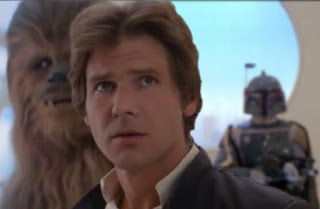 Specifically for me I wanted to see more Han Solo, Chewbacca and Boba Fett. I didn't get any of that in the Phantom Menace. Which I could have lived with had they not killed off Darth Maul so soon. I was warming to him because he had that similar, mysterious, Boba Fett vibe. Han and Chewie also had some of that Boba Fett vibe. Not especially the mysterious part but they're fully realized and established characters that you learn bits about as you go along. No back story, no origin, no discovering their place in the world. The prequels seemed obsessed with explaining the origin of everything... (thanks for ruining Boba Fett for me) but I digress. The other major criticism is that The Force Awakens has all the same key beats as Episode IV, A New Hope. Not just the same hero's journey story structure but similar events and characters. Again there's no denying it but that doesn't make it a remake. 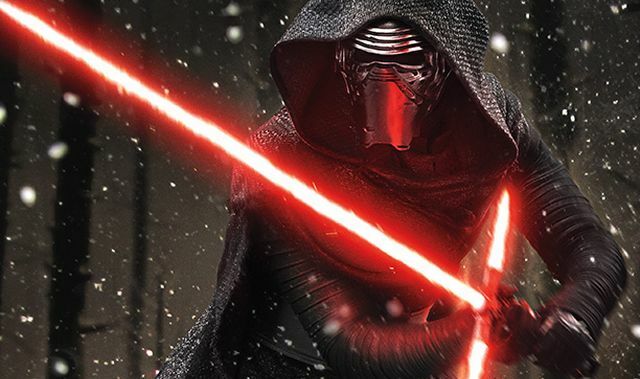 The originality of The Force Awakens is in the detail and not the broad strokes. Like the prequels The Force Awakens redesigns almost everything. In the prequels they made everything seem new and shiny (which was a mistake and only made you notice the CGI more), in The Force Awakens everything is either updated or given another layer of dirt and grime (or both). A lot of the redesign is very subtle such as the new look Tie Fighters, X-wings and Stormtrooper masks. You see them and know what they are straight away but they're not your original trilogy designs. Even the Millennium Falcon has that square antenna dish instead of the round one it had pre battle of Endor. Then there are the things that you haven't seen before but but should have, like crashed, rusting out Star Destroyers and other ships, Chewie actually firing his Bowcaster rifle, Stormtroopers burning down villages, blood on Stormtrooper armor, someone other than Han who actually speaks Wookie and someone who can use the force to freeze blaster fire in mid air (how much more impressive would Darth Vader have been if he'd pulled that move on Han on Bespin?). I'm probably forgetting a lot because I've only seen this movie once - some of us don't have the time or inclination for multiple viewings in a theater. That doesn't make me less of a fan... back when I was a kid it was rare to see a movie more than once in a cinema and I was no less of a fan then. What's important is that I was entertained and the movie felt like it could stand tall alongside the original trilogy and call its self a Star Wars film. As entertainment and re-watch value it's as good as, if not better, than each movie in the original trilogy. However it falls short of being the best of all the movies because you'll get the most value viewing it if you are a fan of and have seen the original films. That's the whole point of it being fan service and a new chapter in the series. There were really only two disappointing moments for me in this film... Hans death and the destruction of Star Killer base. Even though Han is my second favorite character after Chewbacca I wasn't upset with him actually dying. It was the fact he fell into a seemingly bottomless abyss - which is a trope of the series, I get that. However when Kylo Ren stabs Han, it looked to me like Han should have just fallen backwards onto the gantry they both were standing on. Probably a lot less dramatic but it would have given you a little more time to dwell on the concept of Han being dead and felt more final. Han falling seemed awkward and forced to me. I'm not upset about the death because I'd rather remember Han Solo as he was in the original trilogy. It was great to see him again here but he did kind of come across as a retired war veteran who's fallen on hard times. Plus, his death seems to have resulted in Chewie being Rey's new side kick for the moment - don't tell me that isn't awesome and would've happened if Han had said at the end of this film 'No more adventures'. Star Killer base, again I didn't have a problem with Death Star 3.0. Armies everywhere are always trying to develop a bigger weapon. The fact is the Death Star worked except for a tiny flaw. Death Star 2.0 worked except that it needed self contained shield generators (which I guess it didn't have because that section wasn't built yet). It's reasonable to expect a weapon that can wipe out multiple planets is something any army would build if they had the means. No, the problem was that the base was blown up completely, yet again. Sure Star Killer base was storing enough energy to wipe out multiple planets in its core but did it really have to implode like that? Couldn't the New Republic just disable the thing for the moment and the new trilogy plays out like the original one was intended to - with the destruction of the big, scary, planet destroying base in the third movie? 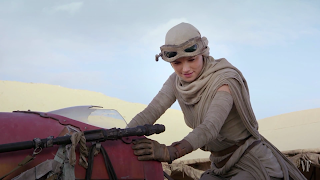 I do like Rey as the new main character. Finn and Po were also great in their roles too but I particularly liked Rey. It wasn't much of an issue for me that she seemed highly capable and extremely quick to master basic aspects of the force like mind control and telekinesis. People say she's never heard of the force and then starts mastering it very quickly but clearly she has because she asks Han about all the 'stories' being true... and don't tell me people aren't still talking about Darth Vader's use of the force thirty years later even if they've never heard of Anakin, Yoda, Ben or Luke. Rey is not the whiny 'always with you it cannot be done' kind of character Luke was. She's pretty confident in everything she does. Finding out she's strong with the Force, I have no doubt she'd be trying out things that she's heard about in those stories - especially in a tight situation with few alternate options. Finn and Rey's lightsaber skills were also fairly believable I felt. Rey's confident using a staff so who's to say she hasn't used regular sword like weapons too. Finn's got Stormtrooper training which appears to include fighting with some kind of baton like weapon. 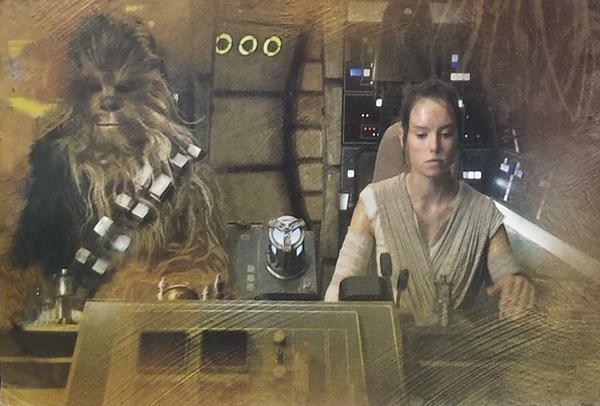 Neither looked particularly confident with a lightsaber and, I have to say, it didn't seem like Kylo Ren's lightsaber skills went too far beyond slicing up control panels in a rage. Captain Phasma was a little disappointing in the sense that much was made of a female Stormtrooper in an obviously important position in the First Order... and then she didn't really have much of a role to play. You'd barely know it was a woman in the role. Was it not for the pre-release hype I would have been fine with the character's part in the film. There is a lot more I could go on about but I really just want to say this film did almost everything it needed to do to bring a new era of Star Wars to the big screen. It is fan service. It is like a greatest hits of the original trilogy but this wasn't the time to be too experimental. This movie was to get the fans back on board and to bring new fans up to speed. This movie was there to remind you why Star Wars was good and to show you that the magic is still there even if it got a little lost in the prequels. This is the movie they needed to make so that those Star Wars movies that follow can be more original and introduce new ideas and concepts. 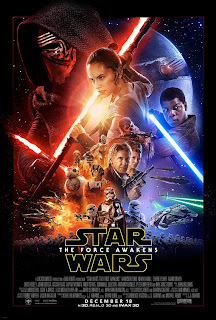 Most importantly this is the movie that remembers Star Wars is about adventure not Jedi Councils and Politics. I really enjoyed it and I look forward to the next chapter... and maybe even those side story films like the upcoming Rogue One.